It is time to wake up- Our oceans are dying! Green Peace and all the other organizations get a big fat F for their message these days. All they scream is the polar ice caps are melting and anyone living along the coasts are going to go under water. What they are missing is we have a much worse problem going on that will kill life on planet Earth way before New York City and Washington DC disappear. Industrial Agriculture is the problem, not oil, not cars. If you kill the soil you kill the oceans. It is all tied together. Every time you cut into the earth you are killing it. Agriculture must go to no till farming to start turning this around. Ok I will make this easy for you. You go grow a garden and when its done you go yank everything out. You just killed the earth. If you grow your garden and instead of yanking everything out, you instead cut it off at the ground level and leave the roots in the ground. You plant your next crop in the ground and repeat. You keep all bare earth covered with mulch or more plants. You no long till, You don't yank things, You keep the earth covered. Your earth becomes a rich loam full of minerals and heals in a few years. When we get acid rain it gets soaked deep into our ground that acts as a sponge that cleans it up and heals our earth. I have been doing a lot of research and most of my information comes from 2 other researchers John Roulac johnroulac and Walter Jehne walter-jehne . Next you might be telling yourself that Agriculture won't be profitable growing this way. So I will post a picture showing the average gross revenue per acre in California. 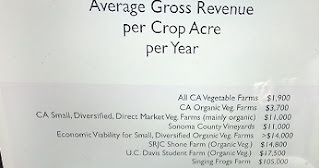 The bottom entry "Singing Frogs Farm" grows all their crops using this method. There is something going on but the "Global Warming" stuff wasn't making sense. Listening to these guys, things are making sense and they have solutions to fix it that makes sense. The oceans are losing oxygen as they warm up. Between California and Hawaii in the next twelve years if things don't change will be so deoxygenated that any wildlife that swims into it, will suffocate. The tiny snails along the California are already showing signs that they are slowing dissolving. I wanted to pass this along so others can research and maybe we can save planet earth after all! Frankincense oil not essential oil! I used frankincense essential oil in diffuser to fight cancer and other problems along with diet changes and exercise. But if you really have cancer that you can't beat this is info that a friend shared with me last week. Her fil had just found out that he had bladder and kidney cancer. 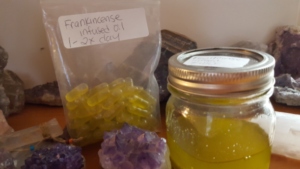 So among some other herbal remedies I have made for him, I made frankincense oil for abnormal cell growth which is safe to be taken internally. This is NOT essential oil (Frankincense Essential Oil does not have enough boswellic acid concentration if its there at all to be therapeutic) but this is an oil made by infusing the resin into EVOO this way the boswellic acid is preserved rather than distilled out as it is during the process of making essential oils. When people say Frankincense oil heals abnormal cell growth, this is the oil they are speaking of. I then made capsules for him to take internally and a salve with added sandalwood and lemongrass which are both anti cancer, to apply topically where his bladder is. I wanted to share this info to help any out there who are in the big fight of their life. EVOO is a type of olive oil. I found Evoo and frankincense resin in the Amazon Market place. I realize I am in my mid 60's and not getting any younger. I want to keep going and going and going and the best way to do that is to keep going and going and going. I cleaned up my diet. The only meds I take is singulair is keep my asthma under control and something for my allergies when needed which is Zyrtec this year. I also take a baby aspirin daily as I never want to do the blood clot thing I had to deal with a couple years ago. I mostly use herbal medicine. When I fractured and dislocated my hip the hospital wanted to send me to the city for a hip replacement. I went home instead. I used Dr.Christopher Bone and tissue formula both the salve and pills and I used a good chiropractor. yes I was in unbearable pain but I worked through it and after a month my hip was back in place and when my doctor took another xray the fractures were all gone. I am not willing to get a hip replacement if I can take care of it myself. I don't carry the gene that causes blood clots so after my 3 months flat on my back dealing with a 5 cm clot I took fancy drugs for a year and then went on a baby aspirin. I never want to be in that spot again! If I have a problem I find a solution. I stay active and exercise to keep me mobile and flexible. I push my limits daily. I have so many friends 10 to 20 years younger then me that are falling apart and are no longer able to do daily walks and even do their own personal care. I never want to be in that position. I watched a show on HBO last week called " If your not in the obits eat your breakfast." Great show, watch it if you can! A large group of 90 to 100 year old's that are very physically active. One is a lady that in her 70's her daughter invited her to go out for a walk. It continued daily and in 3 months time she invited her to go out for a race. She is now over 100 years old and is still running races. So if you want to live a long full life get up and get going! If you are out of shape, get in shape and keep going. If you wear glasses please read this post! My son found a site online where you can order your eyeglasses for $10 including the lenses! Really! https://goo.gl/RzCwRw If you use this link they will also give you $5 off on your first order. He found a way to change his eyesight and is rapidly moving toward being free of eye glasses. I've had glasses since I was a little kid and started out where I couldn't tell light from dark at 10 feet away. Yes blind as a bat but without sonar! Now over the years especially since we moved up here to the boon docks, I have taken time to go without my glasses outside when I am working. I get all sweaty and the darn glasses keep falling off so I just leave them inside so I don't lose them. By doing this I now realize I don't need my glasses except to drive. I can even watch my bedroom TV from my bed without glasses. So if you hate wearing glasses, take time to go without them especially when you are outside. Not all the time but 45 minutes a day and you will see changes before you know it. My son has been ordering new glasses about every 3 weeks and they come in 10 to 14 days delivered right to your home. And for $6 to $12 a pair I have been very impressed with them. Every bit as good as the ones I've been paying $100 to $200 for! Never again will I pay those prices for my glasses. I can get 2 or 3 pair for under $30! Ok they have some pairs that go up to $25 and you of course have to have your prescription and they will help you get the other measurements. This was to good of a deal not to share, Hope it helps you out! Making your own Powdered sugar is so very simple to do! Ok, I've cut way back on the sugar usage but once a week we have some kind of dessert. This week I made applesauce cupcakes using a much reduced sugar. I needed a little powdered sugar to glaze them and didn't have any. Having internet is so wonderful at times like this! You can easily make your own powdered a sugar using what ever sugar you want to use. You can use a food processor or a blender and use half the amount of sugar as you need powered sugar. You can use stevia, coconut sugar, brown sugar, powdered honey. I poured regular sugar into my blender and had instant powered sugar. No corn starch fillers, just powered sugar to do my project. I may never buy powered sugar again! Thought I would share this sweet tip that I needed to use today! Losing weight is still possible! A few months ago my son lost his job and so they moved in with us. Currently He is teaching in our local school and part of his daily habit was to lose 50 pounds which he did do and the weight has stayed off. This last week we sat down together so he could explain how he did this. It's a Paleo plan. Where you fast for 3 weeks. You can have coffee, tea and water as long as it has no calories. And if you need it you can have 1 cup of bone broth each day. After 3 days you will no longer be hungry and you have a lot more energy. You must do at least 30 minutes of some form of aerobic exercise each day also. My husband and I have started this and he is losing weight each day but over a 3 day period I have only lost 1 pound and my body started shutting down. I have low blood pressure and the fasting caused my blood pressure to start falling to dangerous places. I had to stop my fast and get enough electrolytes into my system and enough food with lots of salt to raise my blood pressure back up. I am disappointed and will try to figure out how I can do this without threatening my life trying to lose 20 pounds. But it has worked for my son and his dear wife. They have lost lots of weight and they both feel much better now. My husband has lost 6 pounds so far. I think he has decided to wait until after the first of the year to try this again. I know there are lots of folks out there that would love to lose some weight so thought I should share this with you all. My son said after your 3 week fast you will find certain foods that make you gain weight. For him it was dairy. You can continue fasting for 2 or 3 days at a time and then eat for a day or two until you have lost the weight you had planned on losing. A study done at Harvard showed that many folks are a glass half empty type person. But there is a way we can change our personality to become a glass half full type person. Its a very simple act of daily writing down in a journal or just in a note on your phone, 3 things you are grateful for. It doesn't have to be big things, the small simple things will do. After a few months of doing this daily, you will change how you look at things. You will be looking for the good in people. You will be become a happy grateful person. Yes everyone can do this and change their outlook in life. I hope you all can find at least 3 things to be grateful for each and every day!